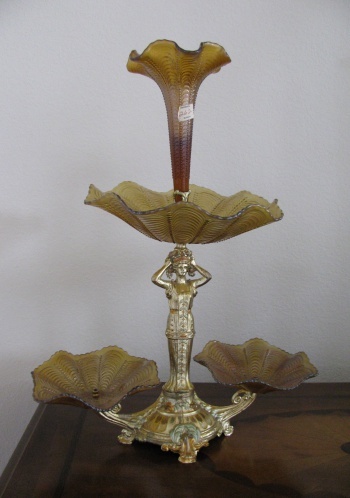 Pattern Description: A metalwork stand with a woman's figure (arms up to her head). 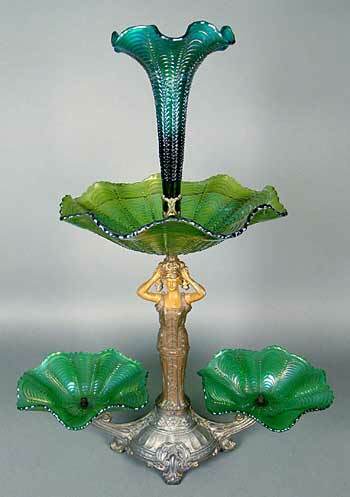 The base of the stand has a bowl on each side, on the woman's head is another bowl topped with a horn. This pattern is actually named after the base that the pieces are on: an elegant epergne that has been identified as German. The central focus is a metalwork ‘goddess' surrounded by bowls (one on each side at the base, one on her head) topped with a horn. The ‘Goddess of Athena' (called ‘Athena Goddess of Arts in Rose Presznick's book) holds her arms to her head (as if holding the bowl and horn). The pattern on the bowls is Beaded Peacock Tail. The total height is about 21-22″ and it is approximately 16″ wide. The lily (horn)is about 8 1/2″ long, the smaller (lower) bowl measures 7 1/2″ wide and 2″ deep while the larger (upper) bowl measures about 10 1/2″ wide and 3″ deep – the bowl measurements could vary based on depth or ruffling. Production could have been as early as 1905. Other metal stands are used for the same bowls (will be listed under Beaded Peacock Tail). The pattern on the bowls and horn is described as rows of gradient arcs moving to the outside from the center, separated by rows of raised beads. The only reported sales are for two green epergnes: one for $2750 in 2001 and another for $1600 in 2009.